ALBANY – Defense lawyers again are the beneficiaries of Albany politicians' continuing run-ins with corruption accusations, new campaign finance filings show. Both former Senate Majority Leader Dean Skelos and Sen. Robert Ortt of North Tonawanda tapped into their campaign funds to hire lawyers to defend against accusations against them. The indictment against Ortt recently was tossed out by a state judge. Tapping campaign accounts to pay for lawyer fees is a bipartisan practice in Albany. While Republicans are on a slight run the past six months, there is a long line of Democrats taking the same route. Gov,. Andrew Cuomo spent a lot several years ago when federal prosecutors were looking into an anti-corruption panel he shut down. Other Democrats who have used campaign funds for lawyers over the years include former Gov. David Paterson and former senators Carl Kruger and Pedro Espada. Kruger and Espada both were convicted in corruption cases. 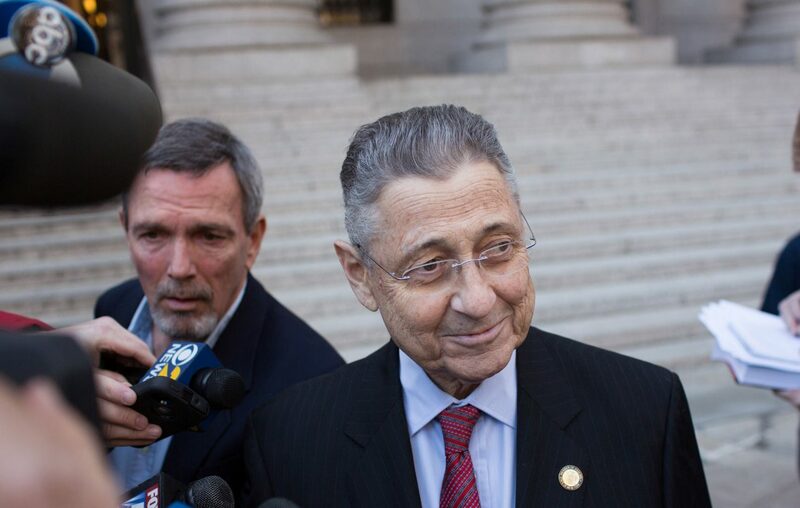 And more recently, former Assembly Speaker Sheldon Silver used his campaign fund to defend himself from corruption charges. At the time of the indictment against him in 2015, Silver's account had $3.2 million. But he used much of that on defense lawyers, and by July 2016, his fund was down to $109,000. Silver has not used his campaign account in more than a year to pay lawyers’ bills, according to filings with the state Elections Board. But an appeals court recently tossed out his conviction. Government watchdog groups criticize this use of campaign money. “Part of it is we have an old-fashioned view that campaign contributions are supposed to be used for campaigns, not for get-out-of-jail-free cards,’’ said Blair Horner, executive director of the New York Public Interest Research Group. Skelos, already convicted in his corruption case and now awaiting word of his appeal, used his campaign account to pay $50,000 to a Manhattan firm representing him in the matter. Skelos, a Republican, still has $843,000 left in that account. Attorney General Eric Schneiderman in March accused Ortt of submitting false election reports as he tried to hide a no-show job scheme involving his wife. Ten days earlier before the charges were brought, the senator’s campaign reported making a $15,000 payment to O’Connell & Aronowitz, an Albany law firm that represented him in the matter. Ortt said he did nothing wrong and blamed the Democratic attorney general for engaging in a partisan “witch hunt” against him. A state judge in Albany recently tossed out the case, saying there was no valid line of reasoning for a “rational grand jury” to indict the Republican senator. Since the first payment in March, Ortt’s campaign wrote another $15,000 check to the Albany firm. Two Western New York firms – George Muscato in Lockport and Clayton & Bergevin in Niagara Falls – were paid a total of $8,800 by Ortt’s campaign during the period. Just prior to the indictment being announced, Ortt hired Mercury Public Affairs, paying the Manhattan firm $12,000 for work such as crisis public relations. Since the case was dismissed, an Ortt spokeswoman said Mercury is no longer being retained by the senator’s campaign. Former Sen. George Maziarz, meanwhile, also has used his campaign account to pay his legal bills. Schneiderman charged him with violating election laws in a separate corruption case. State Sen. 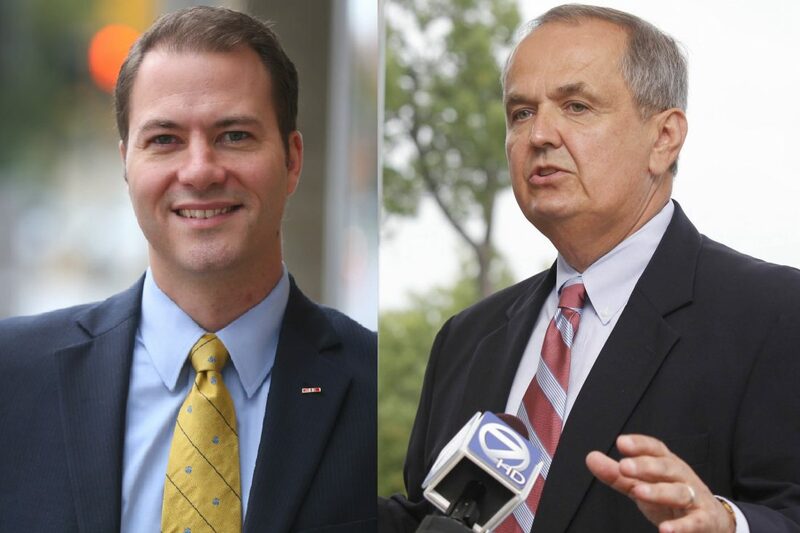 Rob Ortt, left, and former State Sen. George Maziarz have spent campaign funds on legal defense costs. Maziarz the last few months has spent $48,000 with three different legal firms, most of the payments going to Buffalo lawyer Joseph LaTona. Additionally, Maziarz used his once-loaded campaign account to pay for a $374 hotel charge by a Marriot in Albany for a “court date” in May, along with $126 for a car rental to get him from his home to the courtroom. His campaign still has $637,000 on hand. The practice of New York politicians leaving office with large campaign accounts has been growing over the past decade. In some cases, the leftover funds were used for defense lawyers for trouble they got into while in office. During the past six months, Gov. Andrew Cuomo’s campaign made two payments, totaling $54,000 to Manhattan firm Petrillo, Klein & Boxer. Cuomo last year made $534,000 in escrow payments to that firm to place a hold on previous donations that individuals and companies caught up in the Buffalo Billion probe made to his campaign. A Cuomo campaign spokesman said the law firm has done legal work for the general campaign and managed the escrow payment deposited after eight individuals were charged by the U.S. Attorney’s office. Two Western New York Republicans, meanwhile, turned to their campaign accounts after facing criminal charges. In other cases, the money has been used for “political” purposes, such as dinners, sports tickets and donations to other political accounts. A who’s who of retired state officials have gone into lobbying and, years later, still dip into their former campaign accounts to make donations to statewide and legislative officeholders who they are lobbying. "When people contribute to campaigns, they expect that money to to to promoting ideas and policies, not a personal defense fund,'' freshman Sen. John Brooks, a Long Island Democrat, recently said in promoting a bill he introduced in February to ban use of campaign accounts to pay defense lawyer costs. The bill stalled in the 2017 session. Horner, the NYPIRG head, said the practice of politicians using their campaign accounts to pay for legal defense bills effectively reduces the cost for an unethical act. “It’s an effective way for the unethical crowd to assume they will be protected for taking unethical risks,’’ he said. Horner said campaign accounts should be solely limited for campaign spending. He noted other state workers must tap into their personal funds to pay for legal representation if they are accused of wrongdoing. Politicians get an added benefit, he said. If they are exonerated, the state reimburses their campaigns for legal costs. “These aren’t charities. Paying a lawyer is not a charitable donation … They should face the same financial risk as everyone else,’’ Horner added of politicians who tap their campaign bankrolls.